Taking the profit out of killing animals – Is Asset Recovery the answer to poaching? Poaching endangered species is the fourth most lucrative criminal enterprise after illegal drugs, human trafficking and counterfeiting. Estimates ranging from $8bn to $23bn a year in revenue is being generated through these offences, which have a catastrophic effect on the numbers of some rare species. 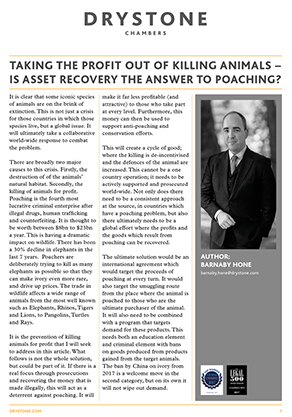 In the following article, Barnaby Hone explains how current Asset Recovery law might be used in the fight against poaching and suggests ways in which countries might tighten their existing Asset Recovery legislation and also details how the proceeds of recovery might be used by those countries to carry on the global fight against poaching endangered species.